The Portland Chapter of the Harry Potter Alliance is one of more than 50 Harry Potter Alliance Chapters worldwide. We are a group of Portlanders from all ages and backgrounds that work together to fight the “Dark Arts” in our world. In the past, HPA Chapters have achieved amazing things by raising money for local and international charities, planning educational programs, organizing large book drives and food drives, and diligently campaigning for equal rights and social justice worldwide. We believe that we are called to be “heroes” in the Portland community by spreading Harry’s message of fairness, truth, bravery, and teamwork. In short, we are the “real world” Dumbledore’s Army. Interested in making a difference? Join our Facebook group to stay up-to-date on all our happenings. 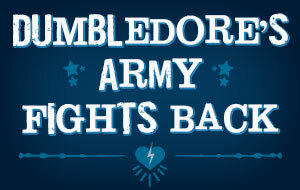 More information on the Harry Potter Alliance can be found at http://www.thehpalliance.org.